Pakistani Mother Daughter Matching Outfits- Every daughter has a sacred relationship with her momma which is above any other relationship and most of the times their mommas are their fashion gurus; designing their wardrobes, picking up matching shoes for them and making them feel super special about themselves. Dressing up is a part of evoking that confidence which comes out automatically when you’ve dressed up right for the right occasion. Pakistan is a country where all occasions are celebrated with festivity and most of the time with friends and family all together. Mothers who have to pick up outfits for themselves as well as their daughters have to take quite some time to go through the latest trends and styles which can make the mommy daughter duo look just exquisite. Sometimes moms can twin their outfits totally and for the other times, they go for something that will make both of them look just super cute and the coolest among all. Pakistani moms rarely go for matching prints but they often go for similar cuts when picking up ethnic outfits. The article is going to help you in picking up yours and your daughter’s outfits which will complement the event and your bond. Princess like outfits are loved by little girls; also because such tiny outfits are way too adorable for any little princess to ignore. Momma can match embellished gowns in luxurious clothes with her daughter’s Disney princess’ style frock and go for some classy diamond style ear studs. A softer makeup look will be ideal for such an attire. Have a look at these 30 Trending Party Outfits for Pakistani Girls. Independence Day is celebrated with great enthusiasm and now mommies don’t need to stress about 14th August party wear because there are many outfits in flag’s colors available at different stores. Also, bangles look extremely ethnic and green and white ones look super cool on independence day. 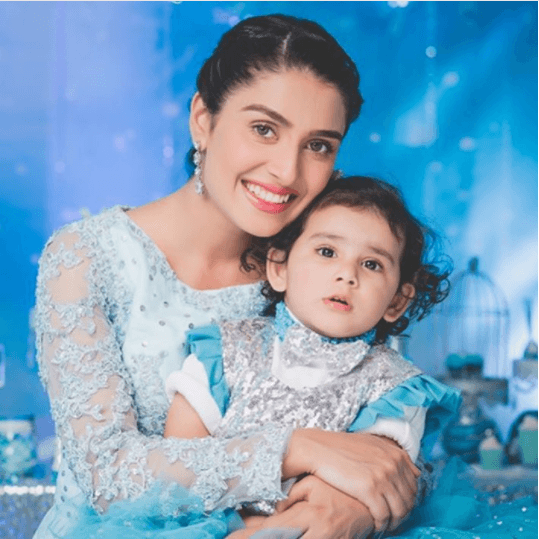 Just like Syra and Nooray, you can totally slay the mommy daughter duo on Eid day in a pretty skirt in cotton with a little embroidery and moms can go for a light kurta in the day light. It’s both simple and stylish for the festivity of Eid. Don’t forget to get bangles matching your outfits as they spice up the Eid look. Check out 15 Ways to Accessorize Eid Dress with Jewellery. Spring is all about light frocks and peplum tops in lawn and semi-cotton material and light lemon color has been trending quite much these days. You and your daughter can go for a similar outfit in the spring shades like lemon. parrot green and bright orange. Long dresses are just perfect for vacationing around a sea shore and you can dress your little girl in one as well so that she can feel free and the light fabric will make her feel comfier. Off-shoulders have been trending in Pakistan since last spring and long dresses with off-shoulder cuts look super cool especially when you’re going for a beach picnic. Here are 30 Best Bridal Shower Outfits For Pakistani Weddings. Wedding parties like Walima or After Nikah ones are considered to be quite significant as women are supposed to wear fancy and luxurious outfits. Mom and daughter can go for the same color palette when picking up a wedding outfit with little embroidery and embellishment around the neck. Little girls can go for gharara or palazzo pants which look extremely beautiful with short kalidar frocks. Your mini-me’s birthday is definitely a memorable day for you and you definitely would like to doll-up for the event along with her. A pleated net embroidered frock for you and your mini-me is an extremely cool option considering the trends. Go for stiletto heels with that which will spice up your birthday attire. Have a look at these 20 Classy Outfits for Pakistani Girls with Short Height. Little girls are obsessed with funky little frocks so light cotton frocks seem perfect for them when traveling around but what about mommies? They can go for stripped jeans with cotton casual tops or even tees with some comfy shoes like sneakers or even joggers. Mehndi is considered to be one of the highly celebrated wedding events which are full of vibrant colors and you can dress up your mini-me in an outfit just like yours and similar shades will give make you both look extremely cute. You can go for organza and jamawar material with lining in some soft material to keep it comfy. For more wedding style inspiration, here are the Best Outfits Of Pakistani Celebrity Couples. A glamorous skirt is what makes you look perfect for an evening party or a bridal shower. You and your princess can go for matching skirts and tiaras. What can make a better duo than a mommy and daughter twinning ghagra and choli with long ever going dupattas and some stylish embroidery and embellishments? Here are 20 Elegant Outfits for Pakistani Women Over 30. Party outfit like saree can be twinned with daughter’s frock when you go for somehow similar material for both. Momma can twin her blouse with daughter’s frock or blouse and daughter can twin her skirt with momma’s saree. The ensemble will look extremely stylish. If you wanna go for a semi-formal look for a dinner or a brunch then you may match you kameez with your princess’s party frock or you can even match your bag and heels with her outfit. Here’s a great collection of Curvy Pakistani Girls Fashion. Momma can dress her daughter in a matching peplum top or a super cool floral shirt and herself in a kind of resembling print when they really wanna kill the mommy daughter duo. The classic silk luxury cigarette pants with beautifully embroidered kurtas by Saadia Asad is an ultimate mom and daughter matching outfit choice for any formal event. The collection basically made every Pakistani mommy’s life easier. Pastel and versatile shades of charcoal and lavender turned into beautiful outfits for Pakistani mommy and daughter are a perfect ensemble. The highly precise applique work with scrupulous embroidery is every mother’s dream. Here are 18 Cute Pastel Outfit Combinations and Ideas to Wear Pastel. Gharara pants made in jamawar, net or even lawn are just perfect for any formal party or even dinner and stunning luxury appliqued kurtas in organza will work as a cherry on top of it. Beautiful peplum tops with skinny jeans look super cool as well as cute when worn by mommy and daughter with multi-color scarves. Mother and daughter can slay matching capes in winters with matching long boots. Have a look at these 22 Stylish Outfits to Wear with Long Boots This Season. When it comes to designer Eid outfits, nothing can beat the exquisite outfits of Maria B. For Eid 2017 too, Maria B has come up with a fabulous “Araam Bagh” Collection that is all about luxury with comfort. Here’s a glimpse of some of her latest outfits that would look great on any mother daughter duo. baby comes in the earth as like a gift from Allah..